One of Korea’s most loved dishes, japchae seems to be one of those dishes that can be found almost everywhere and at any time. 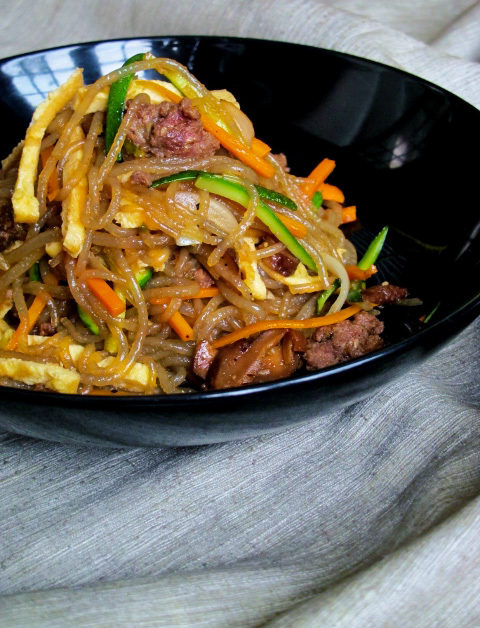 Be it at breakfast, dinner or at a party, japchae is almost sure to be a feature. Like so many national dishes in Asia, food can represent so much more than just a tasty meal; in the case of japchae it is all about colour and harmony. Translating as “many kinds of various vegetables” japchae is made with the five colours that the Koreans believe reflect obang saek or world harmony to you and me. Each colour symbolises one of the five universal directions – North (black: beef/mushrooms), East (green: courgette/cucumber), South: (red: carrot), West (white: onion) and, most profoundly, the Middle (yellow: egg). World harmony aside, the best news about japchae is that it is banting and LCHF friendly! Okay, so there is a bit of sugar in the recipe, but at its core japchae’s sweet potato starch noodles are a great low carb alternative to the regular wheat variety and taste infinitely better than courgette noodles. Noodles without the carb-induced guilt; now what could possibly be better than that? To be honest I was a bit hesitant about trying japchae when I first encountered it at a breakfast buffet in Seoul. I had tried cooking with Korean sweet potato noodles previously and it was a bit of a disaster, but I figured it couldn’t hurt to give it another go. I’m so pleased that I did! Chewy, beefy and incredibly satisfying; from the first bite I knew japchae was going to be one of the first Korean dishes I would attempt to recreate when I got back to my kitchen in Cape Town. As it turned out, making japchae at home is relatively easy and aside from the sweet potato noodles themselves, all the ingredients are Asian store-cupboard staples. The only real difficulty is that the numerous components of the dish need to be individually prepared and cooked before being assembled, but other than that it is actually pretty straight-forward. Just don’t be tempted to soak the sweet potato noodles for longer than 30 minutes or overcook them as this will affect their texture. Most of the japchae I had whilst in Korea actually didn’t contain any meat so if you would like to make a vegetarian version of the dish simply omit the beef. If you do, however, want to make a meat version then you can also substitute the beef steak with some mince instead. It’s no secret that I absolutely adore noodles, I could eat them for breakfast, lunch and dinner – in fact, I’ve done so more times than I care to admit! To my mind they’re the ultimate fast food and I just can’t get enough of them. I would be hard-pressed to pick my favourite, but if I had to chose, wonton mee would perhaps rate as my ultimate noodle, making this the perfect choice for my 100th post! A childhood favourite and made up of a medley of distinct components, wonton mee is a master-stroke of combined flavours. Rather unsurprisingly, wontons are key, along with addition of char siu and sliced pickled chillis, but there are no hard or fast rules. 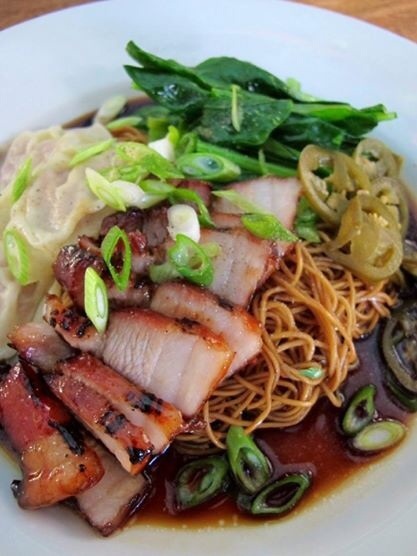 The interpretation of what constitutes wonton mee is notoriously diverse; the wontons can be boiled or deep-fried, the dish can be served wet (in a soup) or dry (with a sauce). It all comes down to individual preferences and finding a hawker who meets your expectations! Personally I like mine dry with soft wontons, lots of pickled chilli and white pepper – naturally my recipe reflects my own preferences, but you should feel free to adapt it to your own tastes! Everybody in Penang has their favourite hawker centre and mine was at the back of Pulau Tikus Market. Sandwiched between the textiles stalls and the darkly fragrant meat section, this was the home of my ultimate wonton mee. The mee here had all the elements I loved, plus it was topped off with an enriching thick sauce that was, as far as I know, unique to this particular vendor. I’ve tried to replicate this sauce over the years, but never quite got it right – I guess somethings should be left to the professionals! Midway on my daily cycle between home and school, stopping at the market for a quick bite was part of my morning ritual. Dressed in my school uniform I would sit perched on one of the many battered tin stools; my feet raised above the ever-wet concrete floor, knobbly teenage knees strained against my ill-fitting khaki school trousers. My order placed, I sat eagerly awaiting my wonton mee fix. The meal was always short lived, devoured in a matter of minutes and washed down with a glass of sweet kopi-o ice – there was no better way to start the day! After checking for specks of errant sauce on my white shirt, I would continue on to school, sated and ready to face the high-school dramas that that invariably lay ahead. I can’t say that I miss my school days, but I certainly do miss those morning pitstops at the market! So this is my muddled take on a true Penang classic! Universally the Noodle-World is typically divided into two distinct camps: soupy or fried. Every great noodle-eating culture has its own unique fried classics – in Thailand the ubiquitous pad thai reigns supreme, whilst yakisoba proudly flies the flag for Japan, but in both Malaysia and Singapore the undisputed king of fried noodles has to be Char Kuey Teow. 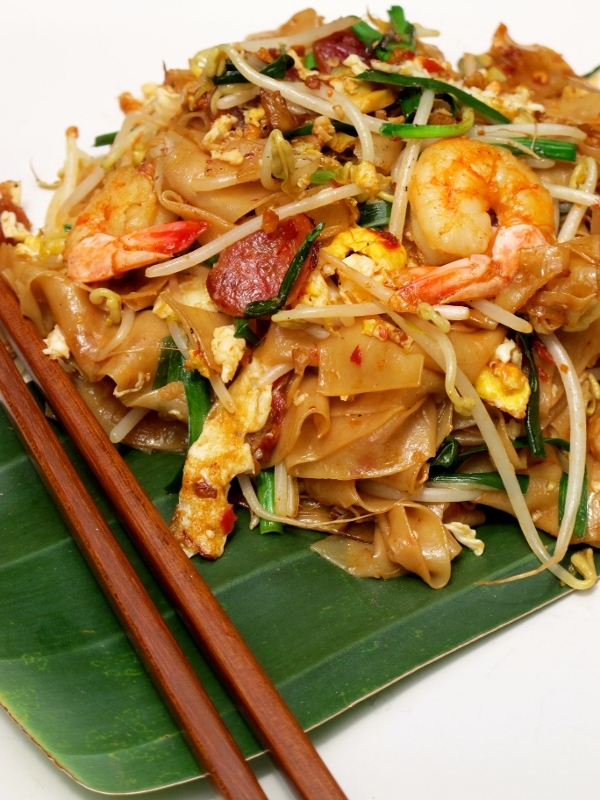 Literally meaning “fried flat rice-noodle”, Char Kuey Teow enjoys enduring popularity through-out both Malaysia and Singapore, manifesting in many delicious guises, accommodating a variety of tastes and dietary restrictions. Sliced fish-cake and bean-curd are popular variations, especially with halal interpretations of the dish, but Char Kuey Teow is at its best when eaten in its most authentic form – Penang-style! Like all hawker-fare in Penang, everyone has their favourite Char Kuey Teow stall, the most popular of these can immediately be identified by the snaking queues that lead to them. In Malaysia one should never be put off by a queue for food – invariably they end in a tasty delight that is always well worth the wait! Stripped back, Penang Char Kuey Teow is a very simple dish made with just a few well chosen ingredients. With the exception of the noodles, the dish is made up of just 6 vital ingredients: prawns, beansprouts, Chinese chives (garlic chives), egg, Chinese sausage (lap cheong) and blood cockles (see hum), although the latter is often omitted locally due to health concerns (and many a runny tummy!). 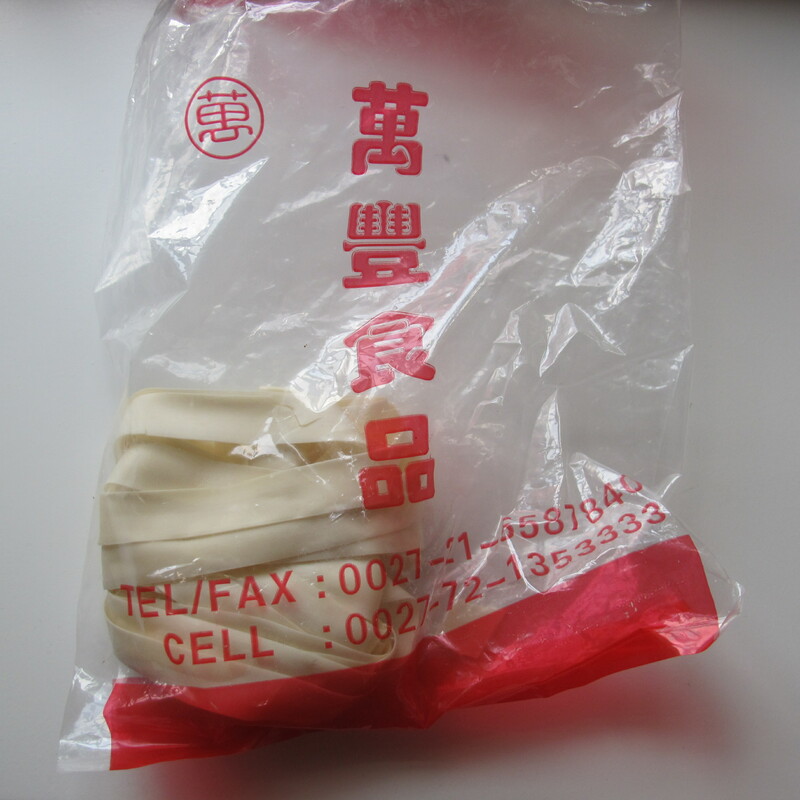 Lap cheong is an acquired taste and is therefore sometimes left out at the request of the customer. Whilst some of the ingredients may sound intimidatingly exotic, they are easily found at most well-stocked Asian supermarkets, although the blood cockles can be trickier to source. These can be left out altogether or substituted with a less exotic mollusc! I often use tinned clams as a substitute. Another important component of the dish is the cooking sauce. Even though only a few teaspoons are added to the noodles, the sauce can make or break the dish. Given that Char Kuey Teow is classic hawker-fare, authentic recipes for its soya-based sauce are hard to come by, as the exact quantities and ingredients are often a fiercely guarded secret! I have tried a myriad of recipes over the years, but the nearest I have found to the real thing is from Rasa Malaysia, although I prefer to use slightly less dark soya sauce. Although the below recipe’s quantities are for a single serving, the sauce recipe will yield enough to make at least 10 plates of Char Kuey Teow and can be kept in the fridge until needed. Ingredients aside, the key to making a decent Char Kuey Teow is technique and a hot, hot wok. A wide, well-seasoned wok needs to be kept searing hot throughout and as a result, only individual portions can be cooked at a time. Given the dish’s ferociously short cooking time (just a few minutes per portion), preparation of all the required components is vital – everything needs to be ready and to-hand when you start cooking. A moment’s hesitation can be the difference between success and ultimate noodle-failure! Dan-Dan Noodles are a specialty of Sichuan cuisine and as a result they are not short on spice or flavour. Enjoyed all over China, there are perhaps a thousand versions of these classic noodles but they all have one of thing in common – they’re all ferociously fiery! 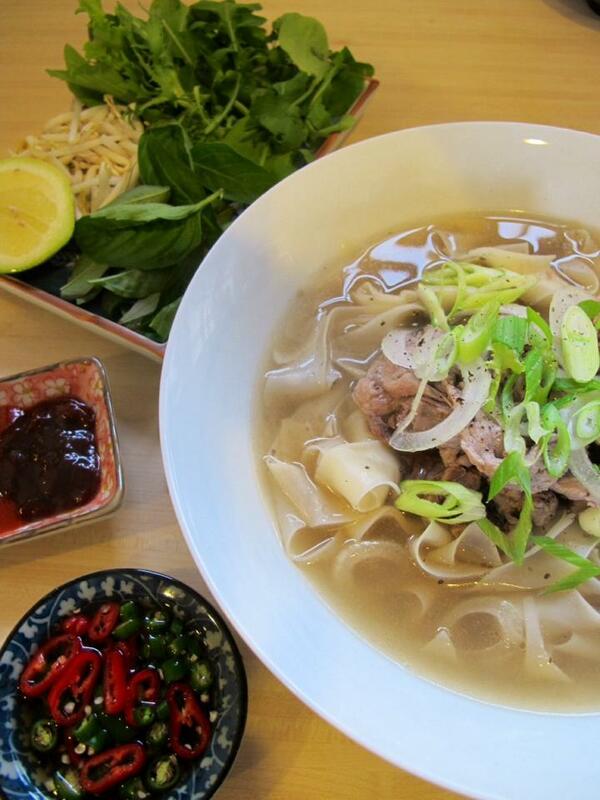 Lip-numbing and sinus-clearing; these noodles are completely addictive! 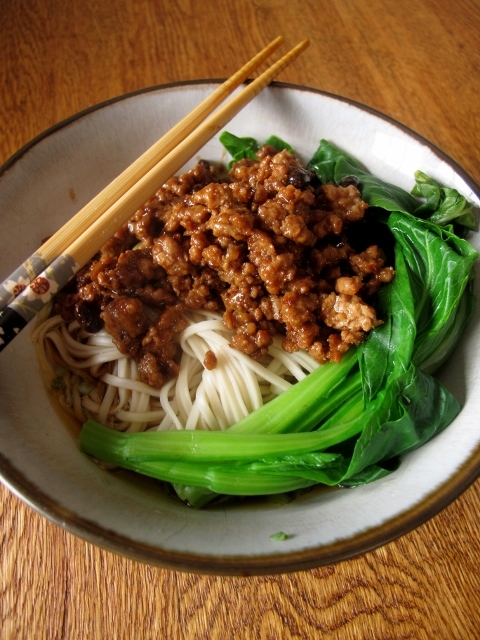 Also known as dandanmian, “DanDan” refers to the shoulder-mounted pole that the street vendors would traditionally use to carry their wares; at one end would be the noodles and at the other, the sauce. In the literal sense, the name translates as “noodles carried on a pole”! Traditionally minced pork is the protein of choice, but if you wanted to, you could always use minced chicken thighs instead. If you wanted to have a completely halal version you could also omit the Shaoxing rice wine. One of the other main ingredients is chilli oil and whilst you can use one that is store-bought, I would strongly recommend taking the time to make your own – it isn’t at all difficult and it makes a world of difference! Once you’ve tasted the noodles made with your homemade chilli oil you’ll never bother with the store-bought version again. If you would like to make your own Sichuan chilli oil, follow the link. The origins of Phad Thai are both fascinating and insidious in equal measure and are a testament to the power of food. Firstly, it may surprise most to learn that this ubiquitous Thai dish is relatively new to Thai cuisine. Conceived as a solution to a national rice shortage during World War II, the then fascist Thai government created and promoted Phad Thai as a symbol of Thai national pride and actively encouraged street vendors to sell it en masses – a government campaign with the dual objective of both reigniting a flagging sense of Thai Nationalism and addressing a crippling food shortage. 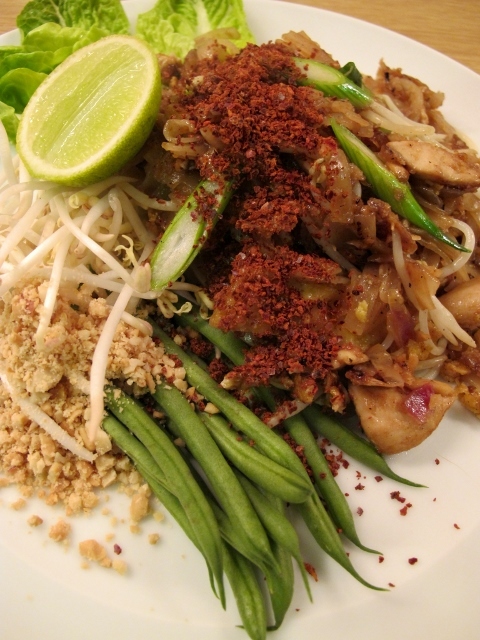 In essence, Phad Thai is culinary propaganda at its tastiest. Sadly, Phad Thai has to be one of the most corrupted Asian dishes in the World. Outside of it’s native Thailand, this wonderful noodle dish has been bastardised beyond recognition by dubious Thai takeaway joints in an ill-advised attempt to make it appealing to a non-Thai palette. I can only imagine the shock that must befall so many tourists who order Phad Thai in the back streets of Bangkok only to end up wondering what on earth they’ve been eating all these years! 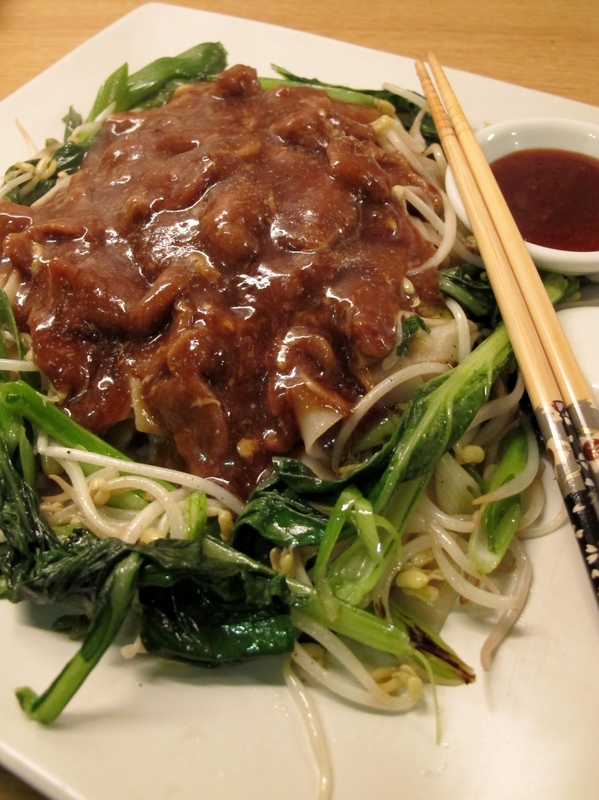 My version is by no means truly authentic but I’ve tried to replicate the original as best I can – the main difference between my version and the usual takeaway fare is that the only vegetables that are cooked are the bean sprouts and spring onions – the rest are served raw on the side. You can decide if you want to add chicken or prawns, the latter being the more authentic version, but the recipe works well without either. Some times in life you’re just haunted by glorious ghosts of noodles-past and beef hor fun has haunted me more than most. These luscious noodles truly rate as one of my all time childhood favourites. That said, even in Noodle Nirvana of Penang a good beef hor fun is hard to come by, but when you do find a place that does it right you’ll be hooked! 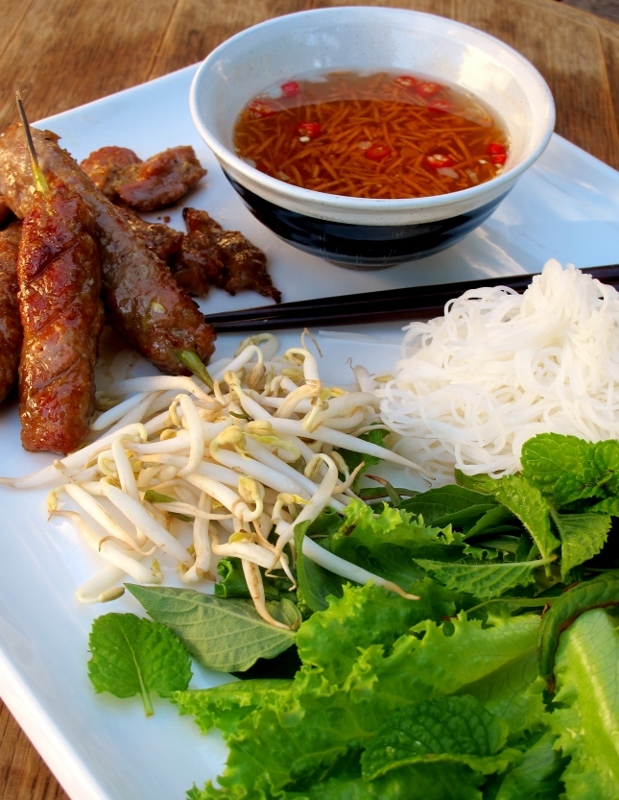 There are two vital components to the success of this dish: super tender beef and silky soft noodles. After trawling the internet I discovered the secret to the tender beef, but I just couldn’t source fresh noodles in Cape Town. Undeterred and determined to feed my hor fun cravings, I tried for many years to replicate this dish with dried flat rice noodles but it was always well short of the mark. That’s until I chanced upon this particular brand of dried noodles at the Mun Fong Chinese Supermarket in Goodwood. Don’t ask me what they are called, my Mandarin is non-existent – all I know is that they’re the closet I’ve come to finding the texture of fresh rice noodles in their dried form. Buy them, buy a lot of them. Anyway, armed with my eureka-noodles I once again attempted to make my version of Beef Hor Fun and I can safely say that I can put this particular ghost of noodles past to rest. Enjoy.